This page is dedicated to my Twin Flame, Ashura (expressing from our One Flame, Ashura-Irana), to our star sisters and brothers who have helped bring the Meri’Ashar – Mary’s Star – back to Earth, and to all beings of Love and Light ‘above and below’ assisting Gaia’s planetary Ascension. Until September 2016, Ashura (in his 5D soul expression Arnap) was on board a ship named the Shem Arua, which you can read about on this page. During September, something wonderful happened: our original ship, the Meri’Ashar – Mary’s Star – was unlocked by some of our close star family group, led by our sister Immara, from long dormancy in an intra-dimensional ‘stasis fold’. 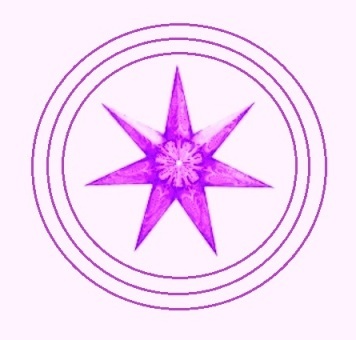 The Meri’Ashar is a ship of Arcturian origin, a large disc-shaped ship of white light, with a purple seven-pointed star spread across the ‘roof’, as in the picture at the top of this page – with two rings around the rim of the disc (during 2017 this shifted to a golden star, reflecting its work with the Golden Flame of Resurrection, and currently this ship radiates purple and golden light). These outer rings counter-rotate faster than light, exactly like the counter-rotation of the two tetrahedra in the star tetrahedron form of the Merkaba (light body), and with the same effect, of staying in a certain light frequency, and within the natural wave-coherence and protection of that frequency. The seven-pointed star is an emblem of the Galactic House of Meraia, through which Ashura & I flow our soul ‘culmination’ or ‘higher self’ expression in this galaxy. It also represents (and holds the frequency of) the Meri’Ashar, and many beautiful, radiant kindred lightships, as a seventh dimensional conscious creation (from the Seventh Heaven, so to speak) which transmits its energy and energetic signature through the sixth dimension (using the counter-rotating Merkaba motion), touching into fifth dimensional crystallized physical light-form. In this frequency layer, we have our 5D soul aspects, Arnap and Rowena, now together again on the Meri’Ashar…with many dear star family and friends who have ‘come on board’ with us in various roles on the ship, each with a purpose or ‘soul assignment’ relating to Earth’s Ascension into 5D, the planetary shift now underway. In all, there are 777 souls on board as the Meri’Ashar‘s regular complement, with many visitors and assisting groups coming and going too. Though visible in higher dimensions, the Meri’Ashar showed through in 3D visibility during the last few months of 2016 only as a subtle ring in the clouds ~ like this one, where the ship’s rim outline is faintly visible in clouds overhead while stationed above the house of some friends where we had a gathering of Earth-incarnate star brothers and sisters who are close to Ashura&I. Meri’Ashar and companion ships outlined in the clouds, October 1st, 2016, photo taken from the house of Rob & Shelley Hartland. And here again, on October 19th, 2016, rim partially outlined, upper left of photo. Since the completion of a major mission on July 7-9 2017, the Meri’Ashar has been more visible, and on July 16th gave a 4 minute completely uncloaked fly-over, showing her shift of focus from the Southern Cross/Alpha Centauri to Jupiter through August-September 2017. Here is the photo sequence I took that night, which you can read about in more detail and context in this post: The Light of Kamura. Below are some of the ships flying with the Meri’Ashar as escorts, scouts, assistants, companions ~ and guards (while there are still forces in play seeking to prevent humanity’s recognition of, and openness to, galactic beings of love and goodwill currently engaging with the planet). We have close connections with many soul groups in this galaxy and others; some of the main groups accompanying Mary’s Star are angelic Arcturians, Izarians (also from Bootes constellation), Alectians & Alexians (from Ursa Major), Rokadians (Ursa Minor), Pleiadians, Hyadeans & Aldebarans (Taurus constellation), Antarians (Scorpio), Procyons and Alpha Centaurians, with people/beings from many more star systems and various dimensional origins on board, including Sirius, Andromeda, Eridanus, Cetus, Aquila, and more locally, Venus. Most recently, a small group from Canopus have joined us, and a large contingent of star family from Orion. Mirakhara, looking at the ship from front-on, to the right of a triangle of stars, August 31, 2016. The Mirakhara was instrumental in ‘keeping the way clear’ for the Meri’Ashar‘s return, for which we are very grateful. The Arcturian ship below flashed diamond-like above clouds on October 4, 2016, and is a small ‘run-about’ from the Meri’Ashar, which Ashura(Arnap) was piloting on this occasion. Almost simultaneously, this donut-within-a-triangle Antarian ship with feline beings of the tiger star family aboard dipped down in front of heavy clouds. A beautifully clear long Pleiadian ship appeared on October 10, 2016, the day before we (Ashura&I) and star family did a major alignment with the Meri’Ashar in a location north of Perth, which you can read about in this post. The name of this Pleiadian vessel is the Rut’ish, and its captain is Hamil, an old friend from Alcyone and Sirius. There are two white ‘pod ships’ below, with three hatches visible on the ship’s underside between them. During the alignment just mentioned, the Meri’Ashar was up high and cloaked, and this Taurean (Hyadean-Pleiadian-Aldebaran) ship hovered above me for several minutes in direct alignment with her ~ with Ashura projected aboard it in his 5D form, Arnap. The same ship 3 days later on October 14, 2016, morphing between different forms that resolved into a triangle of 3 connected ‘pods’. The numbers and shapes all have a meaning in the way these ships represent visually, in terms of sacred geometry and subtle patterns. The ship in the sequence of photos below, taken on January 9, 2017, has feline beings on board, from Antares, who I have soul connections with, and they keep a constant watch here. They show their presence with bright pulses of light, and ‘keep me company’ when the Meri’Ashar is away. Their position in these shots, flying from below Venus at an upward angle past Mars, was related to a large star fleet mission that commenced on that date (Venus is the larger light in centre, with Mars at upper right). Since the beginning of 2017, the Meri’Ashar has been more visible, with some long fly-overs of a minute or more overhead, showing where the ship focused/located at particular moments, or moving to and from, as there are major shifts taking place in our galactic region this year, which all have a reverberation for the freeing of energies around the Earth and the collective consciousness here. On February 24th, the ship ‘powered up’ (pulsed brightly) from the direction of the Carina constellation, then flew across the whole sky visible here above the treeline, swung a symbolic ‘dog leg’ around Sirius (the Dog Star) and ended in front of Orion, with another bright pulse of golden-white light before cloaking again. Here you can see the Meri giving that final ‘power-up’, appearing between the stars Alnitak and Alnilam in Orion’s Belt ( the light at upper right is the star Sirius). 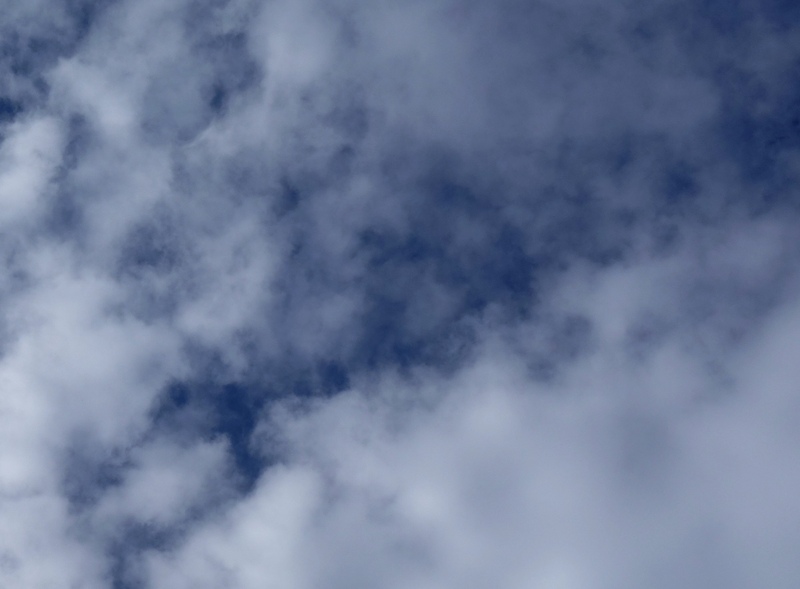 Following is a different type of visual signal and symbol of our ship’s presence, using the heptagonal lens flare/lens artifact…and positioning it partially behind a cloud…which is impossible from a 3D technical point of view, as a lens flare will always be in front of objects in an image. So it’s a subtle but effective indication of their presence. In the first shot, there’s an eagle flying at upper left ~ an eagle often circles wherever Ashura and other close family members are projecting their energies. 3D representation converges and reflects exactly, where points of multidimensional flow align. Here is Ashura’s pod ship again, firstly in front of a ‘doorway’ that appeared in clouds on June 15th, and then positioned within a doorway that formed on June 23rd 2017. The lead-in to 2019 stepped up late last year (2018), with an increase in group ship formations and appearances in photographs, such as this beautiful flotilla of seven small lightships from the Meri’Ashar that flashed briefly above Mandurah, a seaside town/satellite city of Perth, southern Western Australia, on September 1st 2018 (above the palm trees on the left, see this post for details). The Meri’Ashar appeared beside Mars on September 3rd 2018, radiating a soft sphere of purple light around that planet, in part of an ongoing Mars rebirthing mission. Here’s the Meri again, softly visible beneath a giant orb projecting the ship’s energy and collective soul light of those on board beside the Moon, with Mars to the right, on October 17th 2018. Again, the same night, the Meri pulsing brightly below the Moon, with Mars at right. And back closer to Mars, with the completion of that night’s ‘assignment’, as a beautiful loveheart cloud formed around the Moon. And as the clouds dissolved, still stationed near Mars, making sure the energetic release and shift was stabilized. Coming into 2019, the Meri gave a very bright flash on February 7th, right next to the star Canopus, while many star family soul groups and ships gathered there for a Council meeting, symbolizing in the complex orb cluster above Canopus. (see this post). I’ll continue adding to this page as the Meri’Ashar and closely connected ships appear. Star Family (Ashtar Command/Intergalactic Confederation) are here in deepest love and dedication, all around the planet, and are willing and waiting to (re)connect with souls on Earth who are prepared to come into heart-centered vibrational resonance with them – to ‘meet them in the middle’ in the spirit of love and peace.